We’d love your help. Let us know what’s wrong with this preview of Gimme a Call by Sarah Mlynowski. A new life is just a phone call away! Devi's life isn't turning out at all like she wanted. She wasted the past three years going out with Bryan—cute, adorable, break-your-heart Bryan. Devi let her friendships fade, blew off studying, didn't join any clubs . . . and now that Bryan has broken up with her, she has nothing left. Not even her stupid cell phone—she dropped it in A new life is just a phone call away! Not even her stupid cell phone—she dropped it in the mall fountain. Now it only calls one number . . . hers. At age fourteen, three years ago! Once Devi gets over the shock—and convinces her younger self that she isn't some wacko—she realizes that she's been given an awesome gift. She can tell herself all the right things to do . . . because she's already done all the wrong ones! Who better to take advice from than your future self? Except . . .what if getting what you think you want changes everything? To ask other readers questions about Gimme a Call, please sign up. What would the genre of this book be? Would it be fantasy or realistic fiction? Recommended to Arlene by: Goodreads Give-away winner!!! Woo hoo!!!!! Gimme a Call by Mlynowski was a GREAT read that was a ton of fun! I enjoyed the book from cover to cover and could not have asked for a better plot and ending. The storyline is unique, the characters are very well developed, and as you read the book, you wonder… How is this going to resolve itself? Well, Sarah was clever and spot on with her perfect conclusion. I highly recommend this book if you're looking for a break from paranorm, but still want to have some fun with a bit of suspended realit Gimme a Call by Mlynowski was a GREAT read that was a ton of fun! I enjoyed the book from cover to cover and could not have asked for a better plot and ending. The storyline is unique, the characters are very well developed, and as you read the book, you wonder… How is this going to resolve itself? Well, Sarah was clever and spot on with her perfect conclusion. I highly recommend this book if you're looking for a break from paranorm, but still want to have some fun with a bit of suspended reality. About the book… Devi's day is going bad, bad, bad. Her boyfriend of three years just broke up with her via voice mail and now she has no date for the Senior prom. As she listens to the message for the umpteenth time and tears slip down her cheeks, she loses grasp of her cell phone and it falls into a fountain. Well that's just dandy, the topper of her day… but wait! As she dries off her phone and starts pressing the buttons hoping it still works, she finds she can call only one number… her own. So when the phone rings, Devi from three years prior answers and the adventure begins. And boy what an adventure that turns out to be as Devi tries to recreate her past for hopefully a better future through ever changing advice. This book gets five stars from me for many reasons. The storyline is different from the cookie cutter themes currently out there… no vamps… no weres! Yayay! The book is perfectly paced with fun adventure and constant laughs. The narrative from Devi's perspective was engaging and refreshing. And the content made me think about what I would do if I had a chance to counsel my previous self… What would I do differently? What would that advice sound like? Have more fun? Work harder to reap the benefits later? Give myself the winning lotto numbers to change my fate in life? How much am I willing to sacrifice to have a better life? Ha! What a fun read. Did you ever want to change your own past? What would you do if you could talk to yourself when you were younger? What would you tell yourself? What would it change? For Devi, apparently, it would change a helluva lot! I really just loved the concept to Gimme a Call. How many times did I wish I could creep back into my own past and tweak a few things to make things be different for my future? But like Devi (& Ivy) the consequences to change ones past always come with a pric Ha! What a fun read. 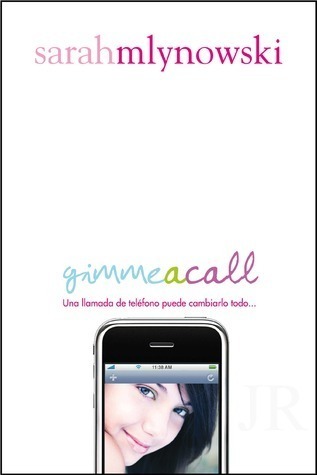 I really just loved the concept to Gimme a Call. How many times did I wish I could creep back into my own past and tweak a few things to make things be different for my future? But like Devi (& Ivy) the consequences to change ones past always come with a price. Funny, light and very entertaining. I weirdly really enjoyed this?? This does NOT seem like a book I would like, but with my friend's high praise and how she got me it for my bday, I had to give it a try - and was pleasantly surprised! I'm honestly shocked I haven't seen this trope done more often since this and "Orange" are the only ones I've read so far - but this whole "older/younger self manages to contact older/younger self to warn them about the future/make things different in the past" is FASCINATING to me! I will admit that, in the beginning, I did not like this book. There was something about the narration, the tone, that just really turned me off. Lately, the books I have been reading have been lighter, a little less impacting, a little less serious. This is great, at times, but, as I made my way through the first few chapters, I considered putting this book down quite a few times. I am so glad that I didn't stop reading this book. Gimme A Call is about Devi Banks. A senior in high school, Devi's I will admit that, in the beginning, I did not like this book. There was something about the narration, the tone, that just really turned me off. Lately, the books I have been reading have been lighter, a little less impacting, a little less serious. This is great, at times, but, as I made my way through the first few chapters, I considered putting this book down quite a few times. Gimme A Call is about Devi Banks. A senior in high school, Devi's life seems to be falling apart. She has spent the last three years of her life with Bryan, the boy of her dreams. She has alienated her friends and her family, everyone around her, all to spend more time with Bryan. But then he breaks up with her and, just like that, she has nothing. Colleges aren't excepting her. It's too late to try and get her friends back. She hasn't really talked to her sister in months. She needs a change. She needs to just figure out how to get things back to the way they used to be. That's exactly what she's thinking of when she drops her cell phone in to the fountain at the mall. When she retrieves her phone and attempts to call her voicemail, it isn't her voicemail that picks up. It's Devi, as a freshman. When I read the synopsis for this book, I remember smiling. The storyline, though unique and funny, is ridiculous. There is just something about the book that is so humorous, even if I could never explicitly figure it out. Sarah Mylnowski is a great writer, where every sentence leads to the next and I was always smiling at something I read. As I got deeper in to this book, I really started liking it. Devi as a senior and Devi at a freshman are two different girls. Freshman Devi is naive, immature, awkward, and really just trying to find her place in high school. Senior Devi is older, has been through much more, but, really, is just as immature. They learn together. Senior Devi realizes that this is her chance, to fix things. She can tell her younger self not to do something, to do something just a little differently, and her whole future will be altered. She doesn't expect everything that happens the last two months of her senior year. She doesn't even see it coming. The book switches back and forth between these two versions of the same girl and, at one point, I couldn't put the book down. I read this book in 24 hours, flipping page after page, eager to see the causes and the effects and what was going to happen in the present. If Freshman Devi does one little thing differently, Senior Devi's whole life changes. The friends she lost are suddenly hers again, and their lives are different as well. Her parents come together and apart and sometimes she's with Bryan again and other times she isn't. Random boys seem to think they're going to the senior prom with her and, at one point, she wins the lottery. Senior Devi becomes a control freak- selfish and manipulating, always telling Freshman Devi what to do so a better college will accept her, so her friends will be healthier, so she will be happier. She doesn't even think about the fact that Freshman Devi is doing everything she says, that that is really her life, then. Freshman Devi just wants to be happy, to make her (older) self happy. She just wants to get through high school and get out in the world and she seems to think that, if she changes a few things now, her whole future will be better. But that's not guaranteed. That's never guaranteed. Sometimes I loved this book and other times I wasn't sure how I felt about it. The writing was great and the characters, especially Devi herself, were so layered and dynamic that it surprised me when I reached the ending. These two versions of Devi were so different in the beginning and, by the end, they are still different, but you can see traces of the older version of Devi in her younger self. This book made me think about living in the present, always doing things to benefit me now and not necessarily later. This book made me think about living in the moment, but also about the impact of all of the little things we do. Something that is insignificant for us can be unbelievably harmful and life-altering for someone else. We can never know, unless we're paying attention, unless we're thinking. This is one thing I just love about books in general. Whether a book is happy or sad, a light read or a more intense one, all of these books still have their meanings. All of these books still have their lessons to be learned, things to make away from the experience. I'm still thinking about this book, even though I finished it a few days ago. I'm still thinking about Devi and the ways she grew and changed, both of younger and older selfs, and I'm still thinking about how different she was in the end. She had changed, grown, developed, and finally learned that, though it takes time, she will eventually get where she wants to go. That ending was really cute. This was an easy, fast-paced read that kept me turning the pages even when the MC began to annoy me (both the older and younger versions, lol). But I enjoyed the writing, and the story, and the concept was executed very well. Adorei este livro, há muito tempo que não havia uma leitura que me prendesse desta forma, que me levasse a não ter vontade de o largar. Este é um livro bastante leve e divertido mas que, por trás disso, esconde uma mensagem. Este livro levou-me a refletir acerca da importância do nosso passado e de não querermos alterar aquilo que já aconteceu, pois tudo acontece por um motivo e cada decisão que tomamos tem consequências que nos levam ao momento onde estamos atualmente. I think that the concept of this book is fantastic. I always wonder about the impact of a simple choice, so books about the different lives a person could be living because of some decisions they make are must-reads for me. This one is different from everything else I've read, so I was really interested about it and I wasn't disappointed. I loved how the younger and the older Devi felt like two different people - which they are, in a way. They're the same person, but their life experience makes t I think that the concept of this book is fantastic. I always wonder about the impact of a simple choice, so books about the different lives a person could be living because of some decisions they make are must-reads for me. This one is different from everything else I've read, so I was really interested about it and I wasn't disappointed. I loved how the younger and the older Devi felt like two different people - which they are, in a way. They're the same person, but their life experience makes them two separate people, which we often forget about our younger self. This book really made me realize how much a person, including myself, can change in a few years only. Also, I've always wondered about what I would think of my older self and vice-versa, so seeing something like that in a book was very interesting to me. Although it's not explained all that much, I loved seeing the relationship aspect of this book. Devi's relationship with Bryan has done bad things to her life, but it's not all black or white. Through this experience, older Devi learns a lot about life and about her relationships with everyone around her, which was nice, since it's like her younger self taught her a few things. I do wish that we could have seen more of Bryan, since 1) he seems dreamy, and 2) he's from Québec, where I live. I wasn't expecting that, but it made me like him even more. His relationship with Devi sounds pretty intense because of how much in love they are, but I would have loved to see some of it, because it sounds extraordinary. I loved this novel more and more as I continued reading it, so I would absolutely recommend it. It's not too serious, but it makes you think about your choices in the present, but also in the future. I'll make sure to look up the author's other novels now, since it's the first one I read from her! Gimme a Call has been staring at me from my bookshelf for quite some time. I bought it because I loved Ten Things We Did and because that’s probably one of my favorite covers ever. So when I found myself in the mood for something fun and fast I knew I had to pick up Gimme a Call. It did not disappoint. Devi’s heart is broken and she wishes that she could go back in time and make different decisions. After a clumsy accident involving a cell phone and a mall fountain Devi’s phone will only call her Gimme a Call has been staring at me from my bookshelf for quite some time. I bought it because I loved Ten Things We Did and because that’s probably one of my favorite covers ever. So when I found myself in the mood for something fun and fast I knew I had to pick up Gimme a Call. It did not disappoint. Devi’s heart is broken and she wishes that she could go back in time and make different decisions. After a clumsy accident involving a cell phone and a mall fountain Devi’s phone will only call herself, from freshman year. I love, love, love this concept. Who wouldn’t love to talk to the you from 3 years ago. Wouldn’t you be so tempted to change some things? Maybe just a tiny bit? That’s pretty much the theme of Gimme a Call. Except things don’t work out exactly as planned, of course. The chapters in Gimme a Call alternate between Freshman Devi and Senior Devi. That might sound like it would get confusing but it never was. They each had a clear voice while still maintaining the same personality. Oddly, I did like Freshman Devi better even though they were the same person. Freshman Devi just seemed a little easier to relate to. Senior Devi was pretty uptight. They were both great in an accident waiting to happen kind of way. They made the worst decisions but it was so fun to watch it all unfold. The story is about Devi, or Devorah, whose life is in a mishap, no friends, worried about college, and worst of all, a boyfriend who just left her. Her cellphone accidentally fell in a wishing fountain, just as she wished she could talk to her younger self, just to re-do everything in her life. Imagine her surprise when her younger self does answer her almost-dead phone, and even more surprising to find out that everything that her former self does differently in the past, changes the future, or The story is about Devi, or Devorah, whose life is in a mishap, no friends, worried about college, and worst of all, a boyfriend who just left her. Imagine her surprise when her younger self does answer her almost-dead phone, and even more surprising to find out that everything that her former self does differently in the past, changes the future, or in this case, her present. So she does everything she can to change her life with the help of her ever-reluctant former self, (which she gave the alias 'Frosh'), from her boyfriend and friends, to the life she wants for her family. Turns out after all in the end, she doesn't need to change everything in her life, just learn how to balance everything out. I finished it in just a few hours. It was a great read, and had a light, perky feeling to the plot. It's no in-depth reading material, nor something you could get hooked up too much like Harry Potter or Twilight. This book had a similar premise of “The Future of Us” by Jay Asher. Another thing they had in common? Great idea with boring execution. Maybe I wasn’t fair to Jay Asher when I wrote that review. Maybe it’s just really hard to write a “past self, future self” story. Because I always liked Sarah Mlynowski’s adult books. Disappointed overall. My Summary: After being dumped by her boyfriend of four years, Devi realizes something: her life is in shambles. With no friends, an estranged sister and parents who hardly speak, Devi has nothing except her broken heart. And her phone. But after accidentally dropping it in a mall fountain, Devi's phone appears to be on the fritz. It keeps calling the same number over and over: hers, four years earlier. Now with a connection to her past self, Devi plans her future - getting into the perfect colle My Summary: After being dumped by her boyfriend of four years, Devi realizes something: her life is in shambles. With no friends, an estranged sister and parents who hardly speak, Devi has nothing except her broken heart. And her phone. But after accidentally dropping it in a mall fountain, Devi's phone appears to be on the fritz. It keeps calling the same number over and over: hers, four years earlier. Now with a connection to her past self, Devi plans her future - getting into the perfect college, keeping her friends, and most important of all: never dating the boy who took over her life. My Thoughts: I picked this one up on a whim, and I am so glad I did! I've never read anything by this author, but that's definitely going to change (seeing as I couldn't put this book down until I was done). I loved Devi's character, and even Bryan's - they seemed like real people and were extremely easy to relate to. I loved that we got to see Devi in the past and present - it really helped the reader figure out her personality and why things happened they way they did. I loved that the author didn't ignore the bad things about messing with your life - and others -as well as highlighting the fact that sometimes things are better left the way they are. It also highlighted the way that some couples seem to burn all their bridges once they get together, and how balance is the key to a relationship. High school senior, Devi Banks, has never really had a great life. Her family barely has any money, her GPA is below average, and she has no friends. So when the only good part of her life, her boyfriend Bryan, breaks up with her, she's left with pretty much nothing, other than loneliness and heartbreak. One day, she wakes up, and she finds that her phone can now only call one number, and that number is herself...as a freshman, before she lost her friends and, most importantly, before she met Brian. She warns her younger self of mistakes to avoid in the future, and but by but changes her life as a senior, but soon realizes that all good things -- including being a millionaire and getting into an Ivy League, have downsides to them. I'm going to be honest with you, I didn't expect much from this book, and my expectations were accurate. It didn't change my life or anything, but it definitely for me in a better mood. I had only picked this book up because I was stressed about school and I've been going through a lot lately and I just needed to take some stress off my chest, which this book did quite well. It got my mind off of anything depression-related, or school-related, and a lot of other things. Devi hates her senior year. In fact, she wishes that she could re-do her whole high school experience. When a freak phone accident occurs, she finds herself talking to her younger self. Now, she can tell her fourteen-year-old self all the things to fix before she ruins her life, starting with not dating her ex-boyfriend. Devi spent so much time with him and neglected her friends and her school work. When they break up, she has nothing left. That's all about to change. She doesn't have to go on that first date. She can spend more time with her friends. She can study for her classes and join in extracurricular activities to impress colleges. Freshman Devi tries to improve their life - but she's stuck with all the work while senior Devi enjoys the benefits. For senior Devi, life's changing quickly. She can't keep up with the changes and, worst of all, she has no memories of the new photos in her room or the changes in her life and those she loves. The more they change, the more they both ask the question: Is it better to know the future? El libro es increíble y tiene mucho humor. Devi is too hung-up on a boy to make the book interesting to adults. As an adult reading this, I would give it only 2 stars, but I came up to 3 since I'm obviously not the target audience. Clean read, suitable to middle grade and up. I liked this book because it was about a new topic: talking with the future or past you. Highschool senior, Devi, accidentally calls her self as a freahman. She decides to completely change her life after a bad breakup...sometimes it's not good to meddle in people's lives, even if it is yours. Indecisa se chego a dar as 4⭐ ou não. Indecisa se chego a dar as 4⭐️ ou não. This was a pretty good read. I really like Sarah Mlynowski's writing and she does the whole 'What would happen if xyz improbable thing were to happen?' really well. Like she just takes a supposition and runs with it, exploring all the possible things that could happen. I enjoyed this. Older Devi was nice and controlling and Younger Devi was nice and flakey and it all just hung together really well. Haven’t you ever wished that you’d be able to go back in time for a do-over? I think on the most miniscule, basic level everyone can relate to that feeling. But will going back in time (with everything you know now) truly change things for the better? Gimme a Call was like the fluffy version of the Butterfly Effect without the actual time travel. In this book, senior in high school Dev is truly miserable. She’s completely alone and feeling sorry for herself. Her boyfriend of 3 years just dumped h Haven’t you ever wished that you’d be able to go back in time for a do-over? I think on the most miniscule, basic level everyone can relate to that feeling. But will going back in time (with everything you know now) truly change things for the better? Gimme a Call was like the fluffy version of the Butterfly Effect without the actual time travel. In this book, senior in high school Dev is truly miserable. She’s completely alone and feeling sorry for herself. Her boyfriend of 3 years just dumped her & apparently, she doesn’t have any girlfriends either because she neglected them for Bryan (now, her ex BF). Basically, Dev ends up calling her freshman self. They are actually communicating, and whatever Frosh Deb does, it completely changes Senior Dev (aka IVY)! But we all know it can’t be that easy. Will Deb be able to save herself from heartbreak, friendlessness, and her future at the lowest tier college ever? I totally loved the premise of the story, probably because there were countless of moments where I wished I could go back in time and do things differently. If I got in touch with myself as a freshman in HS, I would’ve told myself to study harder for the SATs too (just like Dev did). I would tell myself which boys, classes, backstabbing girlfriends, potential disasters, and embarrassing moments to avoid. I would tell myself to NOT make that one colossal mistake of choosing to go the same college with my HS “sweetheart.” Ugh. I was so blind, ignorant, naïve, hopeful, and convinced that he and I were meant to be. That it’d all work out in the end. I was so wrong. I’d tell myself to avoid my ex like the plague – I would’ve probably been better off without him. I’d be in a different city, different college, with different people. But if I did that, I wouldn’t be me. And I wouldn’t have made the friends I did, or lose the ones I had. I wouldn’t have learned the value of true friendship. Would I have even met my current BF? (I met him at a frat party at THIS school that I chose to come to with my ex.) I would no longer be me in the present, with all the mistakes that made me who I am, with all my sometimes shameful, regretful memories, even of that soul-sucking, life-altering breakup I thought I’d die from but ended up surviving. In the end, if I could tell talk to my past self, maybe I’d tell her never to take up smoking. That’s seriously one thing I hugely regret and wish I never ever started; why’d I think it was so cool at the time? I don’t think cancer’s cool anymore. I really should quit, I wish I never started. But with everything else maybe I’d let myself make those embarrassing mistakes, get my heartbroken, feel the familiar closeness I’d shared with my old group of friends. In fact, I might not change a thing. One thing that I thought was very well-done by Ms Mlynowski is that she managed to not reveal to the readers and younger Devi the cause of the break-up for the majority of the book. That added a little suspense and also insured that the reason behind it was not typical. I also liked the message about how important a balance life is that Gimme a Call imparted with the readership. Devi got lucky because she had a second chance, but no matter how much you are in love, you cannot lose sight of your future and friends as Devi did. Especially given how crucial those high school years; they're really the springboard to adulthood and the rest of your life for most people. I also really liked how Devi realized that friendship was important... And I think that the overall problem Devi was facing, getting caught up with their other half and as a result, letting their friendships fade, doesn't only happen when you're in high school, but also when you're in your 20s, 30s, 40s... So I personally felt I could relate to it - although I've never gone out with anyone steady. Any Issues? I really liked the concept of Gimme a Call and I think Ms Mlynowski did a good job writing it. Younger Devi would do something and Older Devi would feel the effects of it right away, she could see the changes in her life... and not all of them, positive. What bothered me however is that it seemed Older Devi did not have any memories of the past three years. The only recollection she had was her own - going out with Bryan, finding herself alone. All she had to prove the changes were pictures and the results (like her college acceptance letters), not the progress... And I find that somewhat sad :( But this is really a minor issue and has more to do with my personal taste than the actual book. Have I mentioned before that Sarah Mlynowski is the queen of adorable young adult fiction? If not, let's say it again! ADORABLE! I picked up GIMME A CALL after reading Mlynowski's MAGIC IN MANHATTAN series. I had no idea what this one was about -- but I knew it would be cute. And, I certainly was not disappointed. Devi, a high school senior, wasted most of her teenage years in a relationship with Bryan -- a cute, sweet, gorgeous boy who breaks her heart and dumps her senior year. Looking ADORABLE! Devi, a high school senior, wasted most of her teenage years in a relationship with Bryan -- a cute, sweet, gorgeous boy who breaks her heart and dumps her senior year. Looking back, Devi realizes that she gave up good grades and great friendships for Bryan, spending all of her time hanging out with her boyfriend rather than studying or keeping up with the girls that have always been there for her. So now Devi is awaiting a future in a mediocre college totally alone. Why did she waste her high school years with a relationship that wouldn't even last? One day Devi drops her phone in a fountain and realizes that it will only dial her own number -- except, someone answers the phone! It's Devi, as a freshman -- right before the downward spiral of Bryan began. So senior Devi comes up with a fantastic plan. She will mentor her younger self, steering her away from Bryan and towards all of the extra-curricular activities and study groups that will set her on the right path to a scholarship to a top notch university. Then, she'll get freshman Devi to spend more time with her friends to ensure that senior Devi isn't spending her last days of high school alone. While she's at it, freshman Devi can even solve a few problems for some friends -- steering one friend away from the gymnastics team that led to years of disordered eating and keeping another friend from starting a relationship with a guy that would end in disaster. Why not save the world while saving her own future, right? But senior Devi soon learns that every small instruction to her freshman self completely alterates the future in unexpected and often unexplainable ways, leaving Devi to wonder if it's even worth it to try and rewrite the past. Is it better to have love and lost than to never have loved at all? Like I said, GIMME A CALL is utterly adorable, engrossing, entertaining, and loads of fun. I read the entire book in a single sitting and I couldn't wait to see how everything ended. I adore stories with time travel and I love young adult chick lit -- so this was a perfect combination of the two. Primero que nada este libro lo encontré entre mis archivos del 2013 (cuando bajé un megapack de 200 libros xd) y como ayer no haya qué leer decidí darle una oportunidad; a ver qué tal resulta me dije. En sí la historia trata de cómo la vida de Devi cambia (¡já! ni que se diga) luego de que su teléfono (con más de tres años de antigüedad) caiga en la fuente del centro comercial y se dañé. Es desde entonces cuando descrubre que sólo puede hacerce llamadas a sí misma, o mejor dicho, a su sí misma de 14 años. A partir de que obliga a Pipi de que confíe en que está hablando con su yo del futuro empieza a darle una serie de órdenes para que cambié su pasado y que por siguiente su futuro. Cuando le dice que deshaga de su principipal problema aka Bryan nota como un montón de cosas cambian, y principalmente como sus amigas vulven a tener contacto con ella. Luego de un montón de desiciones que al principio parecieron súper geniales y que hicieron que su futuro cambiara horriblemente y de maneras inimaginales decide que es tiempo de que su yo del pasado decida lo que de verdad le conviene. Una historia interesante, que aunque no es la obra maestra, te hace pensar en si realmente desearías que todas esa veces que te dijiste a ti misma "ojalá pudiera regresar al pasado y cambiar esto" se hicieran realidad. A lo largo del libro decidí que si esto pasara tal vez no sería la gran idea que tanto he creído... con cualquier pequeño cambio podría hacer que todo de una vuelta súper radical. Así que no, muchas gracias pero no (a menos que este 100% segura de lo que voy a hacer). Los personajes; la protagonista (¿o debería decir las protagonistas? xd) me hartó, me hartó y me fastidió como no se imaginan, porque noté que la mayoría de las veces actuaba por puro impulso, sin imaginarse las consecuencias que se le vendrían y sobra decir que hasta llegó a ser infantil. La verdad es que la pequeña Devi me cayó mejor, parecía que se pensaba mejor las cosas (algunas veces). La mayor parte de la historia me cayeron bien las amigas, aunque algunas veces se me hicieron algo superficiales y algo tontas, pero bueno, nada grave para unas chiquillas de 14 años (habló la de 15 xd). Y finalmente Bryan, ¡oh Bryan! se me derrite el corazón cada que me acuerdo de él y esos pequeños hoyuelos aww. Quedé enamorada del chico,va directo a mi lista de ¡quiero uno por favor!. It's senior skip day and Devi is spending it at the mall alone. She's returning a watch she bought for her now ex-boyfriend Bryan. She has zero friends because she made her whole high school life around him. She starts thinking about what could happen if she was able to talk to a younger version of herself and warn her away from Bryan. Maybe then she wouldn't be in so much pain right now. After dropping her phone in a fountain, it turns out she's able to do just that. She tells Freshman Devi to s It's senior skip day and Devi is spending it at the mall alone. She's returning a watch she bought for her now ex-boyfriend Bryan. She has zero friends because she made her whole high school life around him. She starts thinking about what could happen if she was able to talk to a younger version of herself and warn her away from Bryan. Maybe then she wouldn't be in so much pain right now. After dropping her phone in a fountain, it turns out she's able to do just that. She tells Freshman Devi to steer clear of Bryan, be a better friend to her girlfriends, and focus on school and getting into a better college. Poor Freshman Devi ends up running around like a lunatic trying to keep up with all the changes that her actions make for Senior Devi... which also makes for some really cute and funny moments!! Eventually Freshman Devi figures out she might just have to make decisions for herself, and Senior Devi realizes that just because something doesn't work out the way you want it to, that doesn't make the experience worth throwing away. I LOVE SARAH MLYNOWSKI!!! Ten Things We Did was one of my favorite books last year, so I was really anxious to read another book by her. I was not disappointed! This book was so adorable I just wanted to pinch Freshman Devi's cheeks. But seriously I loved Devi's personality. I love how the author was able to create an older and younger version of the same person and it still felt like the same person. The story alternates between Freshman Devi and Senior Devi's POV, which might sound confusing, but they were different enough that it wasn't. Freshman Devi was so cute and naive that I was hoping somehow by talking to her future-self she would be able to retain some of that. Future Devi was too down and insecure. And then she became too obsessed with getting into the perfect school and getting a scholarship. She was too extreme. I liked how Freshman Devi was able to figure out how to balance out her life in a believable way. Have you ever wished you could change your future by correcting a mistake of the past? If so, you’re not alone. Meet Devi Banks. She’s weeks away from graduating high school and prom is around the corner. It’s her senior year and she should be happy, right? Well, she’s not. You see, her boyfriend, Bryan, of three plus years just broke up with her. Technically, they’re not broken up yet, but they will be when college starts in the fall. Devi heads to the mall to return a present she just purchased Have you ever wished you could change your future by correcting a mistake of the past? If so, you’re not alone. Meet Devi Banks. She’s weeks away from graduating high school and prom is around the corner. It’s her senior year and she should be happy, right? Well, she’s not. You see, her boyfriend, Bryan, of three plus years just broke up with her. Technically, they’re not broken up yet, but they will be when college starts in the fall. Devi heads to the mall to return a present she just purchased for him prior his decision to end their relationship. Angry, confused and hurt she listens (yet again) to his voice message to her. She begins thinking if only she never met Bryan. If only they never were a couple, then she wouldn’t feel so miserable right now. It’s at that very moment, Devi accidentally drops her cell phone in the fountain and her life changes. When she recovers her wet phone, at first glance it appears to be working, however when she tries to dial a number it flashes her number on the screen. Devi soon realizes she’s able to talk to her freshman self, days before she meets Bryan. Devi, as a freshman, is skeptical when she receives her first phone call from Devi, as a senior. After several conversations, she realizes she’s speaking to her future self. Too make things less confusing, senior Devi is known as “Ivy” and freshman Devi is known as “Frosh”. Ivy is able to persuade Frosh into not agreeing to go out with Bryan when he first asks her out. As a result, Ivy begins to notice changes in her life and begins having Frosh alter other areas as well. Finally, Ivy is free of Bryan and their relationship. But is that a good thing? Or what she truly wants? Gimme a Call is a fun read. It brought back high school memories and made me think about what I would have changed in my senior year based on my decisions I made as a freshman. Mlynowski did a fantastic job of setting up the plot and never once confusing the reader. It was entertaining to see how much Ivy altered her life through her conversations with Frosh. What a really cute story! At first I wasn’t sure I would get all that into it. I was confused as it went back and forth. But in true Mlynowski style she pulled me in and kept me there. I ended up not only loving both Devi’s but hoping that things would work out! Gimme A Call is the story of broken hearted Devi, a high school senior that is dumped by the boyfriend she dumped all her friends for. Completely lost and miserable things get worse when she drops her phone in the mall fountain. Now Devi What a really cute story! At first I wasn’t sure I would get all that into it. I was confused as it went back and forth. But in true Mlynowski style she pulled me in and kept me there. I ended up not only loving both Devi’s but hoping that things would work out! Gimme A Call is the story of broken hearted Devi, a high school senior that is dumped by the boyfriend she dumped all her friends for. Completely lost and miserable things get worse when she drops her phone in the mall fountain. Now Devi finds herself without a boyfriend, without friends and without a phone. But wait, her phone seems to work, but it will only call one person, it will only call 14 year old Devi! Through a series of conversations and the slight changing of things in the past by younger Devi, older Devi’s life changes, some for the better, some not so much, causing older Devi to figure out what its exactly is that she wants in life and want changes are worth making to get it. I must admit it was so entertaining to see what kind of trouble the Devi’s managed to get themselves into by changing one small thing. I smiled and giggled and my heart even broke a little at times. I enjoyed the way the Devi’s interacted with one another. They were the same person but after 3 years it was nice to be able to see how much she had changed and grown as a person. What was important when she was 14 was suddenly something she could do without when she was 17. And by Devi talking to her 14 year old self she was able to finally realize what really was important. It started out as a wish over a broken heart but it became a lot more then that. It became a story about figuring out who you are and what you really want out of life. Devi es una adolescente. Chica y grande, al mismo tiempo. Todo empieza cuando Devi, destrozada por su ruptura con Bryan va al centro comercial y se sienta en la orilla de la fuente, desdichada. Entonces sucede: su teléfono se cae a la fuente. Ella va por él y cuando lo tiene ya fuera y todo, intenta utilizarlo. Presiona todas las teclas pero ninguna sirve. Hasta que una sirve: la de llamar. Y llama, entonces lo extraño sucede: una chica joven con voz conocida contesta. Hablan varias veces hasta que Devi es una adolescente. Chica y grande, al mismo tiempo. Y llama, entonces lo extraño sucede: una chica joven con voz conocida contesta. Hablan varias veces hasta que se dan cuenta: la chica es Devi de joven. Ella es Devi. Devi es ella. Y entonces todo comienza, Devi mayor empieza a aconsejarle a la menor pero… ¿Será tan bueno como ella cree jugar con el pasado para cambiar el futuro? –¡Tienes que contármelo! Ay, Dios. ¿Estoy muerta? ¿Me muero? –¿Qué te vas a morir, tonta. –¡Estás tirando piedras contra tu propio tejado! Si yo soy tonta, también lo eres tú. Prométeme que no estoy muerta. Me doy un palmotazo en la frente. –¿Eres un ángel? ¿Me hablas desde la tumba? –emite un grito ahogado– ¿Tengo una enfermedad terminal? –No tienes ninguna enfermedad. No pasa nada malo. Aparte de ser una plasta. Esta narrado por dos Devis, la de 14 y la de 17. Al inicio nos muestra a la Devi de 17 con su vida desdichada y todo. Y luego nos muestra a la asustadiza Devi de 14 años que no sabe que hacer para que su futuro sea perfecto. La verdad yo prefería a la Devi de 14 años ya que, irónicamente, se me hacía más madura que la de 17 años. Es algo confuso al principio, con las narraciones y todo. Pero te vas acostumbrando. Es un libro juvenil, para chicas y muy divertido. Ligero, divertido, completamente juvenil y con un contenido que te hace reflexionar y madurar al mismo tiempo Gimme a Call es una gran novela que sin duda recomendaría a todo tipo de lector. In the book it comes back and forth a lot. The main character Devi gets a call on her phone from only one person ever since she dropped it in the fountain. The one phone call is from herself in the past when she was fourteen. She finds this to be a good learning experience so then she can tell her younger self all the wrong things that happened in the future to never happen in her past at all so then her younger self can have a better life...especially without her ex-boyfriend Bryan. Sarah was born in Montreal, Canada. After graduating with an honors degree in English literature from McGill University, she moved to Toronto to work for Harlequin Enterprises. While she never met Fabio, she used her romance publishing experiences to fuel her first novel Milkrun. Since then, Sarah has written four additional novels for adults: Fishbowl, As Seen on TV, Monkey Business, and Sarah was born in Montreal, Canada. After graduating with an honors degree in English literature from McGill University, she moved to Toronto to work for Harlequin Enterprises. While she never met Fabio, she used her romance publishing experiences to fuel her first novel Milkrun. Since then, Sarah has written ﻿four additional novels for adults: Fishbowl, As Seen on TV, Monkey Business, and Me vs. Me; the New York Times bestselling middle grade series Whatever After; the middle grade series Upside-Down Magic (with Lauren Myracle and Emily Jenkins); and the teen novels Bras & Broomsticks, Frogs & French Kisses, Spells & Sleeping Bags, and Parties & Potions, all in the Magic in Manhattan series, as well as Gimme a Call, Ten Things We Did (And Probably Shouldn't Have), Don't Even Think About It, Think Twice, and I See London, I See France. Along with Lauren Myracle and E. Lockhart, Sarah also wrote How to Be Bad, and along with Farrin Jacobs, she wrote See Jane Write, a guide to writing. Sarah's books have been translated into twenty-nine languages and optioned to Hollywood. She now lives in New York City with her husband and two daughters.